BOSTON, Mass. — The streak is over. Boston College, which had one of the strangest streaks going in college hockey, snapped a 25-game non-conference winless skid (0-22-3) in game one of the Beanpot semifinals with a 2-1 win over Harvard University. Prior to Monday, the Eagles last out-of-conference win was a 3-1 victory over Arizona State on Nov. 13, 2016. The infamous streak started five days later, with 5-2 loss to Harvard, ironically enough. Harvard coach Ted Donato said both teams tried not to show their cards as the teams looked for that crucial first goal. “For the most part, I thought both teams played it close to the vest,” Donato said. 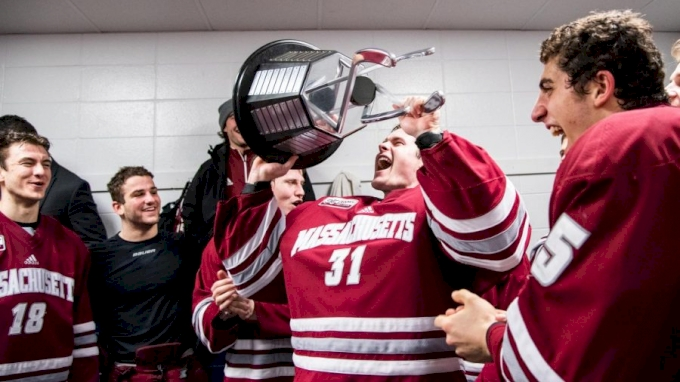 For the Eagles players, it was all about believing in each other to get back to their first Beanpot final since the 2015-16 season when they defeated Boston University 1-0. It was the Minnesota Wild’s third-round pick from last June Jack McBain who scored the eventual game-winner when he drove into the slot to beat Harvard keeper Michael Lackey. The play was started by fellow freshman Oliver Wahlstrom who had the primary assist on the goal—Jesper Mattila had the secondary assists on the goal at the 12:22 mark of the third period. The Eagles (10-12-3 overall, 9-4-3 Hockey East) survived a late power play by Harvard to end the game. Harvard went 0-for-7 on the afternoon, extending their drought to seven straight power plays for the top power play in the country coming into the game at 34.3 percent. The Eagles were scoreless on their five chances on the man advantage. Patrick Giles recorded his first collegiate goal when junior Graham McPhee found him wide open in the high-slot where Giles ripped the puck past Lackey 4:57 into the game. Both teams struggled on the power play as the Crimson had two chances in the first period while the Eagles were scoreless on their only chance on the man advantage in the opening period. The power play struggles continued through the second period for both teams. Harvard took three penalties in a row when Baker Shore took a boarding call 10 seconds into the period. Henry Bowlby took the next two penalties for the Crimson when he was called for hooking at the 5:02 and 7:15 marks of the middle frame. Harvard (11-7-3 overall, 8-5-2 ECAC) had its only chance in the second period when Chris Grando went off for holding at the 10:41 mark, but the Crimson couldn’t convert. Bowlby redeemed himself with 4:23 remaining in the second to tie the game at 1-1 as John Marino went down the right half wall where he found Bowlby in the slot who potted home his fifth goal of the season. Reilly Walsh also picked up a helper. Both coaches praised Toronto Maple Leafs prospect and Eagles goalie Joseph Woll who made 27 saves. His counterpart, Lackey, turned aside 16 shots.